The Sultanate of Oman has finally been graced by a visit from the Winters. Albeit a visit measurable in single-digit minutes, it was rather camel-abundant and filled with glorious scenery. So why such a brief visit to the glorious land of Frankincense, sultans and ancient history? 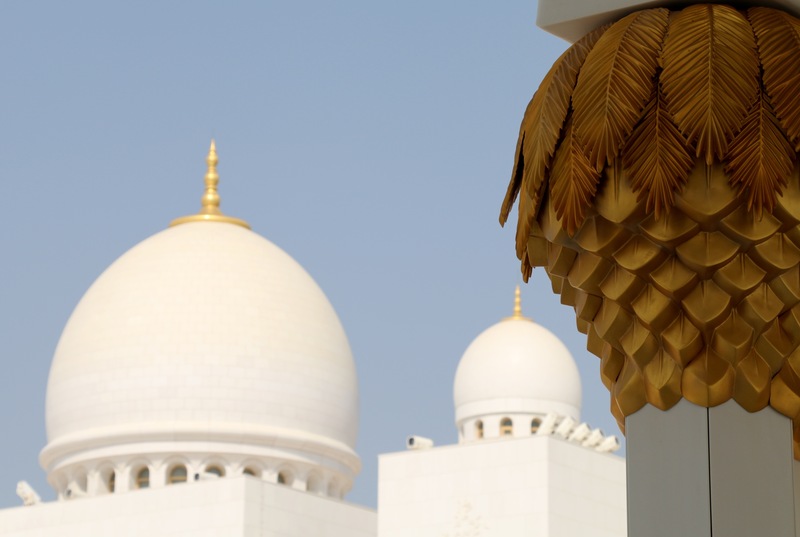 The reason is very simple – to avoid being illegal in the UAE. David, the poor Zimbabwean boy with a British passport, is only allowed to stay in the UAE without a visa for 30 days. 90 days is allowed for the more progressive Northern Europeans such as myself. In order to avoid paying a 300 AED fine per day David had to do what is known here as a ‘border run.’ He didn’t quite run, but considering how quickly he went to Oman and back, he could be the Jesse Owens of border runs. We started our 100 km drive to the border town of Hatta early on Friday morning. The night before we had picked up my friend Kaia from the airport. So the first thing she saw in Dubai was Oman. We like to keep a few surprises in store for our visitors. 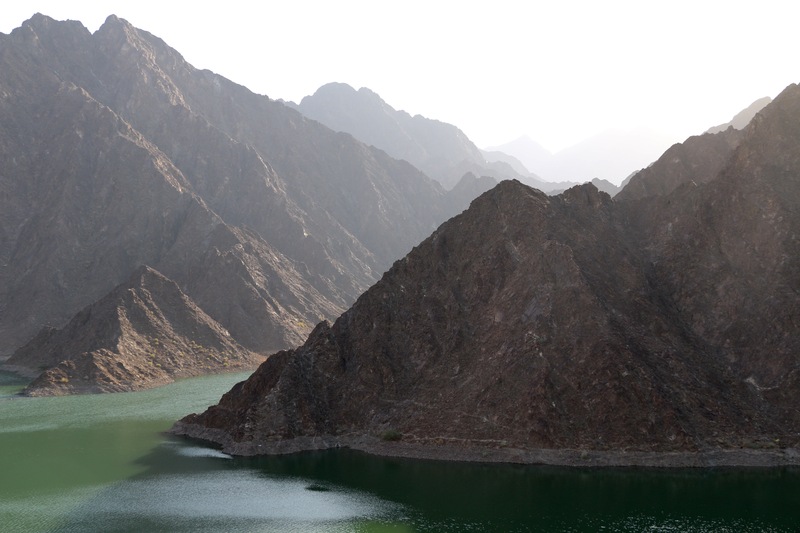 Hatta is a town of some 3000 inhabitants surrounded by mountains and not a lot happens there. 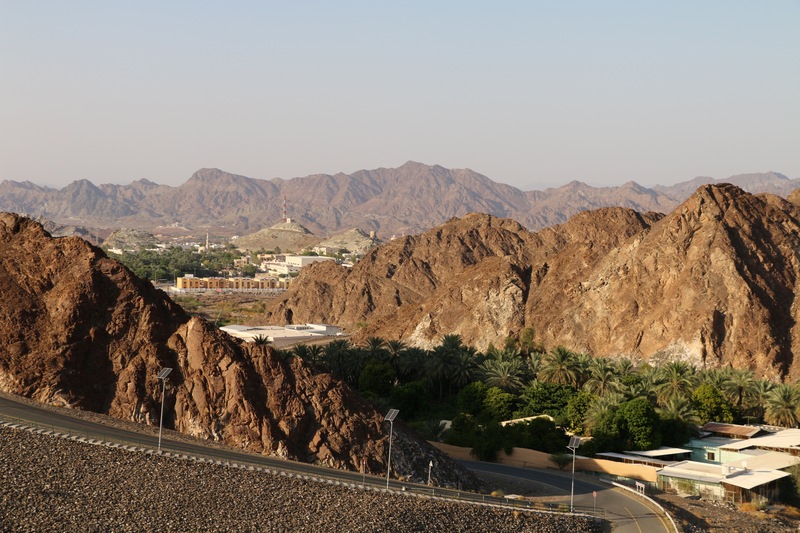 The road to Hatta has many checkpoints, where passports are checked as there is an enclave of Oman for about 5 km, which one has to drive through to get there. 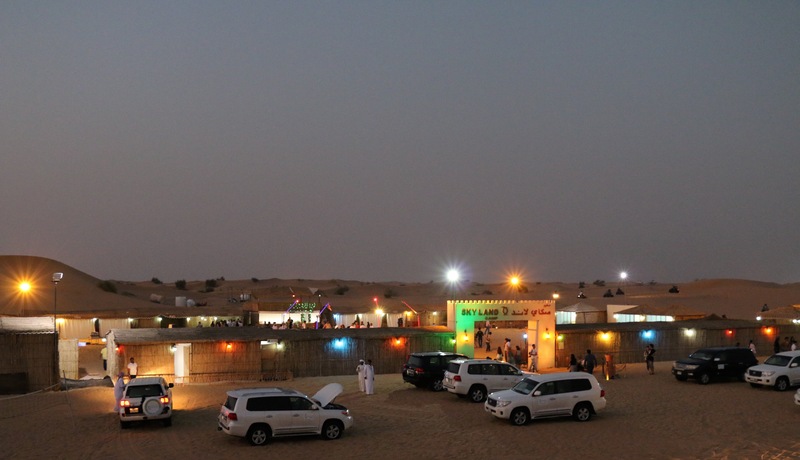 The enclave had one petrol station and many restaurants all flying the Omani flag…and a lot of camels. We stopped to take photos, but when all passing trucks started hooting at us we realised stopping was not really allowed. While David was getting legalised, we waited at the Hatta Heritage Village, which is an open air museum and a model village depicting life people used to live here not more than 50 years ago. As Friday is the main prayer day and most locals and other Muslims would go to the Mosque or stay at home with their families and most Westerners would cure hangovers or be out for a day-long feast they call brunch, the village was completely empty but for some security guards and us. I didn’t want to burn my blonde friend on her first day (and I was pretty hot myself), so we finished our tour of the village quite quickly. As we were walking out of the village gate, a local Emirati man, who worked at the village as a host or something similar, invited us to drink tea with him. We sat down and were served sweet black tea by the Pakistani security guard, who used to work for UNICEF in Islamabad before he lost his job and had to resort to becoming a security guard in the middle of nowhere in the Emirate of Dubai. We were joined by an older Emirati man, who spoke even less English than his younger counterpart, but his kind smiles and sincere surprise at every Arabic word I uttered was so heart-warming. As I understood, these guys worked at the village and their job was to welcome guests and drink tea. Both were very kind, seemed genuinely interested in us and tried their hardest to communicate with us and find out where we were from. The Pakistani guard was very helpful with his English and helped the conversation along. He also knew where Estonia was and told the Emiratis that we have knee-deep snow and absolutely no camels. This was the first time I had a chance to sit down and properly chat with a local. We couldn’t say much due to language barrier, but nevertheless this encounter with the kind-eyed tea-drinking local men left me with a really wonderful memory. We left the village and wondered down the road to the village centre. Must have been quite a strange sight – two blondes walking along a road in the middle of nowhere in Hatta. We were picked up by the now legal again David and after buying Cokes from the village shop we headed for the mountains to take a look at Hatta dam. We take any chance we can to look at water in the desert. Hatta village nestled in the mountains as seen from the dam. 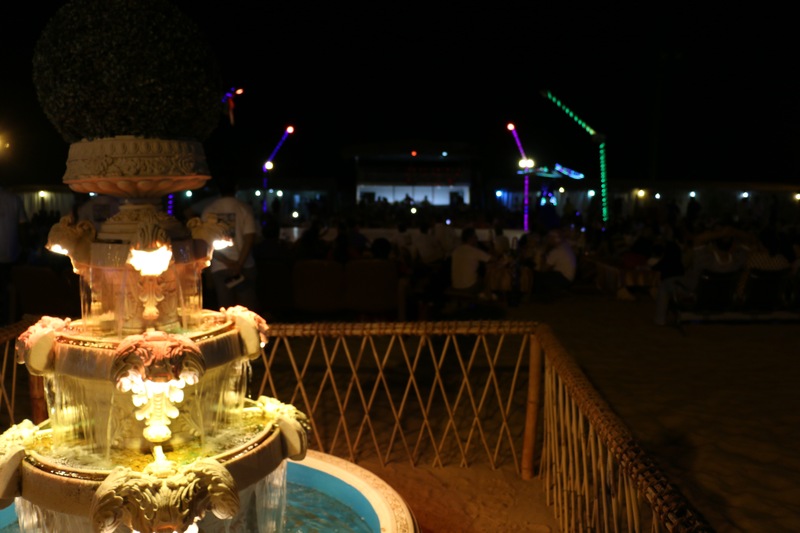 Apart from having been to Oman, we have now also done the most touristy thing in Dubai – a desert safari. A very good deal on Groupon was sent to me by a friend, almost too good to be true, and it was rather…interesting. The safari company was to meet us at a local Indian supermarket, so we got there early, stocked up on samosas, and sat outside in the car park to have a samosa picnic and wait. After waiting for 20 minutes we gave up and went inside for ice-cream. We called our driver, Mr. Ali, who confirmed that he was on his way and was going to arrive now-now. Now-now can mean anything from right now to sometime in the distant future. David the ‘organise-everything-find-out-what’s-going-on-guy’ went to do just that and saw a group of people standing at the supermarket entrance with vouchers in hand. There was a group of Ukrainian, British and very upset Romanian girls, who had all bought the same deal on Groupon and were waiting for Mr. Ali. He did arrive after being an hour late. Mr. Ali drove us for about 40 minutes out of Dubai and into the desert. Once we got there, we formed groups of 6 and got into 4×4 cars, which took us to a desert camp bashing over the dunes to the sound of Arabic music. The dune bashing was actually very much fun and even a bit scary at times. Our driver the funny guy said he was from Taliban when I asked where he was from. He was most likely an Omani, though. We got to the camp after about 10 minutes of holding on tight and wondering when the 4×4 was going to topple over and were welcomed by camels clad in colourful blankets, ATVs, sand boarding and hoards of tourists. The camels looked exhausted and bored, so we decided to go sandboarding instead. The sandboard turned out to be an old snowboard without any boots. So we stuck our bare feet in the snowboard footholds and ignored the piercing, determined to get our money’s worth. The sand wasn’t very slippery, so we gave up on these attractions, which at first seemed really exciting and went inside the camp. We took a seat on a carpet, which was laid out on the sand and sat around a table admiring all the tack around us. Kaia and I got a henna decoration on our hands by a blasé Pakistani lady, who had probably decorated hundreds of hands on that day. A heavily accented Russian lady soon announced that she hoped we had a good trip ‘with the four wheel’ and a show was about to begin and we were to get some food as well. Food is not worth a mention – it was less than average. The belly dancer was the first one to take to the stage. 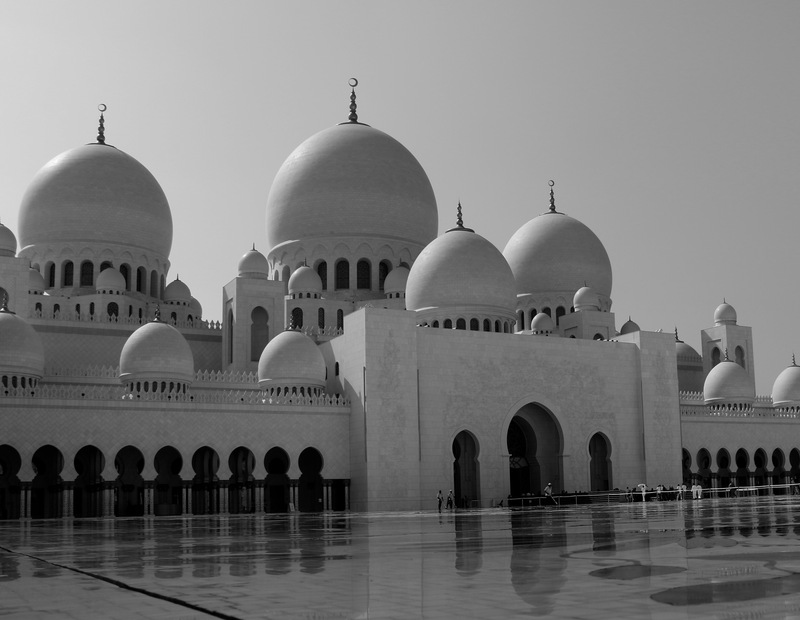 She was very skilled and quite entertaining, but hardly represented the Emirati culture. We later found out she was Argentinian. There were a few more dancers that came up on the stage – the Turkish style twirling guy and a sweaty guy throwing around a stick of fire. 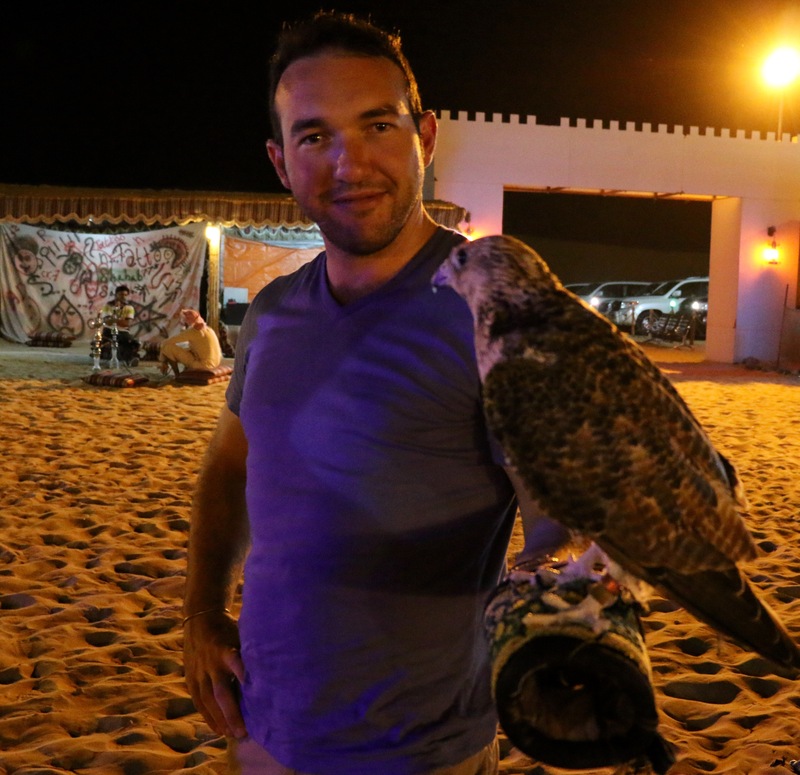 In the meantime one could indulge in some shisha and hold a tortured falcon for 10 Dirhams. But the best and most amusing part of this desert experience was this fountain in the middle of the camp. Undoubtedly a feature in most Bedouin households. Never again. After a disastrous desert experience I was determined to continue with my own plan and places for my visitors. 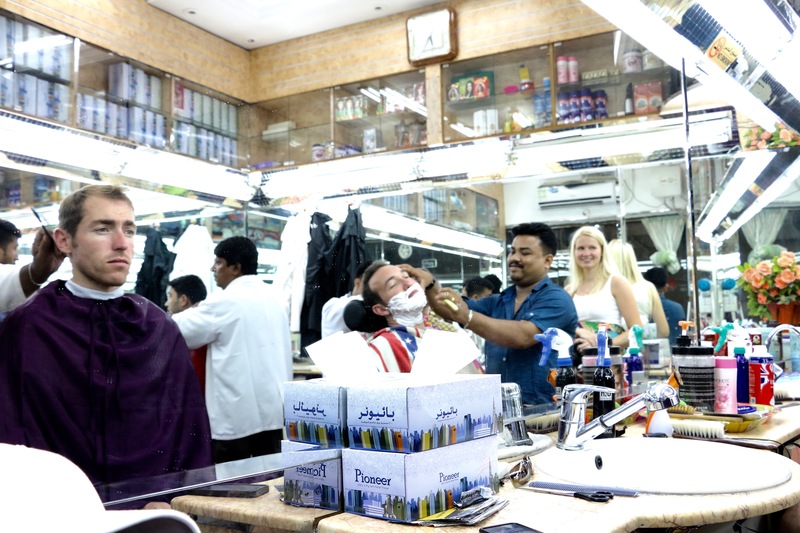 I like to discover places in Old Dubai and find out where the local workers (read: Indians, Pakistanis, Bangladeshis, Filipinos etc) go to get their food, have fun and hang out. One of these places is the fish market, which is slowly creeping onto the more intrepid tourists’ schedule. The market is located right next to the port, so you know the fish that is sold there is fresh as it comes straight off the boats. The market is open every Friday from 5 am and that is really the best time to go to get the freshest produce and the full experience. 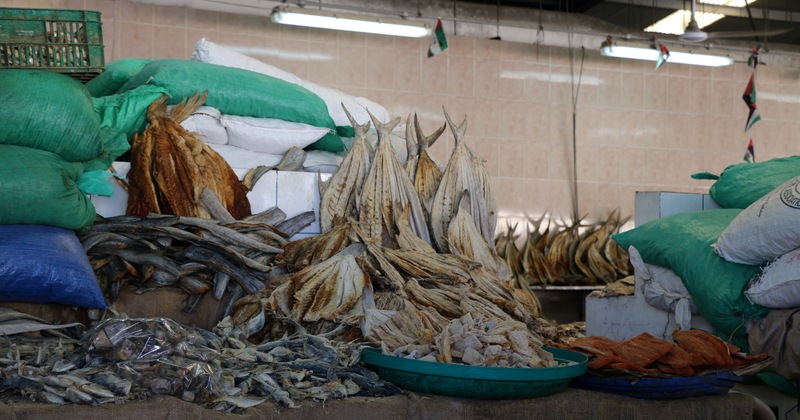 The market starts with a section of dried fish and seafood – a popular local snack, which is similar to dried and salted fish we eat as a snack in Estonia. 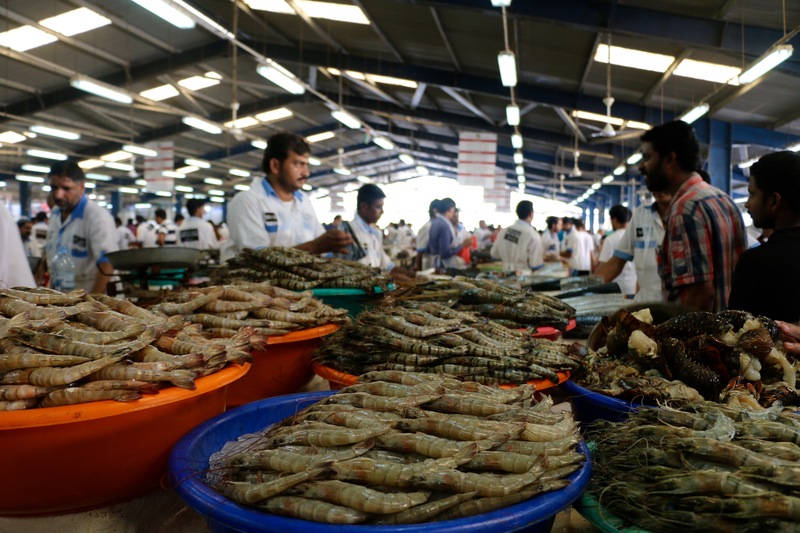 The market is like any fish market – a bit smelly, wet and chaotic. As white people, we stand out in the crowd very well and as soon as we emerged from our car were approached by guys with wheelbarrows offering to carry our soon to be purchased fish. When we visited the market for the first time we had a guy help us find parking. Little did we know that accepting his help was a cue to him that we require his services for the rest of our visit. So, feeling awkwardly white and somewhat colonial, we had this guy carry our 0,5 kg of tuna to our car a 100 metres away for 20 AED or about £3.50. We accepted no help during our second visit and managed just fine. 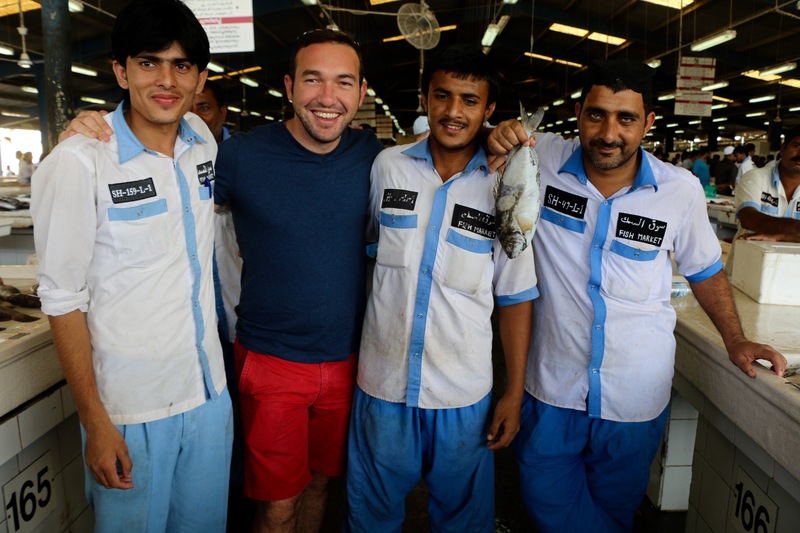 The fishermen are very friendly and eager to pose for photos with their fish. They actually walk around and stick fish in your hand and ask to take a photo. They never asked for money for it, but probably expected us to buy their fish. However, this time we were met with even more attention as we presented an anomaly to the market – a pregnant blonde Western woman. My brother’s girlfriend was approached from every angle by guys asking her to hold their fish and she was very happy to do so. As soon as a photo is being taken, guys from all over the market run over to be in the photo as well. After some hard bargaining we left with tuna, king prawns and squid less than half the price we would pay in a supermarket for imported produce. 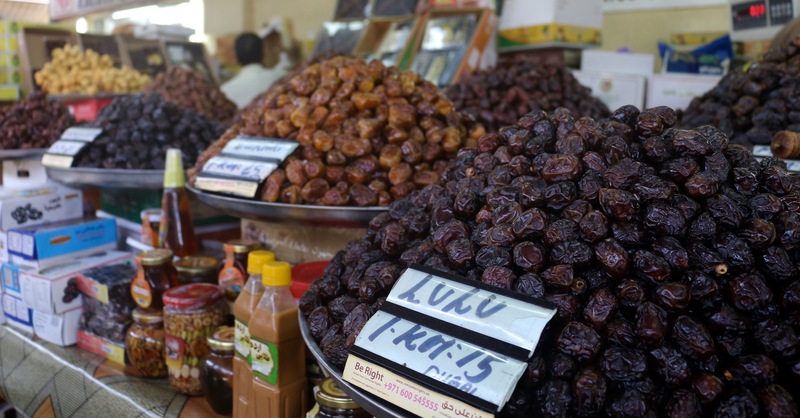 The market has a section for fruit, vegetable, rice and dates as well. We walked through it tasting mangoes on the way, bargaining a fair price for tomatoes and eating sticky dates from Saudi Arabia. 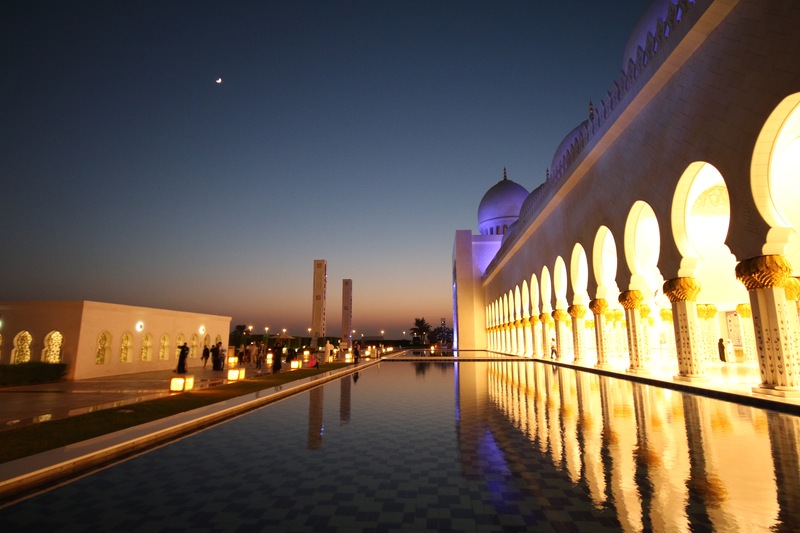 All of our visitors are usually taken to this glorious mosque in Abu Dhabi. This time I actually had my camera. 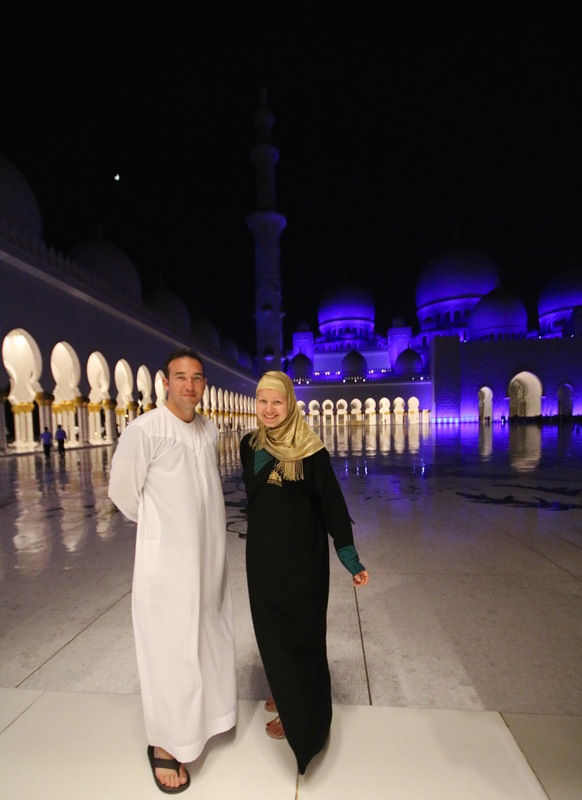 As usual, we had to go and get dressed respectfully – abayas for women and dishdash for men. No holding hands, touching or frolicking of any type is allowed, understandably. We had some Amish visitors. I saw two nuns there – not a usual sight in this part of the world. Interestingly, they were asked to wear the abaya as well. This, my friends, is the world’s largest hand-knotted carpet. I may or may not have told you yet that my husband loves cricket. We also have some cricket crazy friends, so this section is dedicated to them with the hope that we will see them here next year. It all started when I got David t-shirts with his favourite cricket players and then stole them all to wear them to the local markets. Turns out that wearing a Sachin Tendulkar t-shirt can get one very good discounts. And this is how I came to love the game of cricket, which still remains a mystery to me. Cricket is also quite popular here as there are many people here from the Indian subcontinent, the UK and other countries, where this game is very popular. We went to Abu Dhabi cricket stadium to watch the Pakistan vs England test (?) match. We got to the security gate, where the guard informed us that we had to go buy tickets in a booth that was located a few hundred metres from the gate – local logic. We paid our 20 AED for the tickets and headed through the security, who tried to take off our cameras, laptops and water. Branded clothing was also prohibited. We ignored the rules and went in to enjoy the game. The tribunes were only about 1/4 filled. We figured this was, because most people, who would want to watch the match had to work that day. We only stayed for an hour as we got there quite late and the game finished. I have watched two other cricket matches live, both lasted for the whole day. I must say that I like the one hour dose of cricket quite a lot. I tried to understand what was happening in the match, but all the rules explained to me about a million times by David and our friend Tommy had vanished from my head. My brother and his girlfriend were there with us – I am pretty sure we broke the world record for most Estonians seen at any one cricket match. We fully enjoyed the fans, however. The Pakistani fans led by a little girl were blasting out support to their guys by yelling ‘Pakistan zindabad’, which means long live Pakistan I think. I joined the Pakistan fans anyhow. The England supporters, known as the Barmy Army, had a whole array of songs up their sleeve, which they proudly blasted out. The small number of spectators meant that the players really engaged with the audience and the Barmy Army was encouraged to sing a song to each England player. What else to expect when visiting Winters in Dubai? 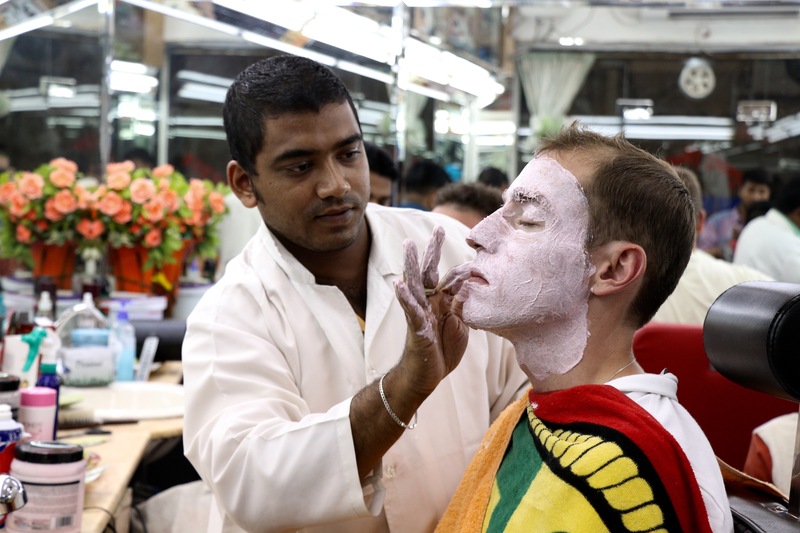 If you are a man, definitely a wet shave in a Bangladeshi ‘saloon’ (don’t be scared, Tommy, you can just have a haircut and a strawberry scented facial). 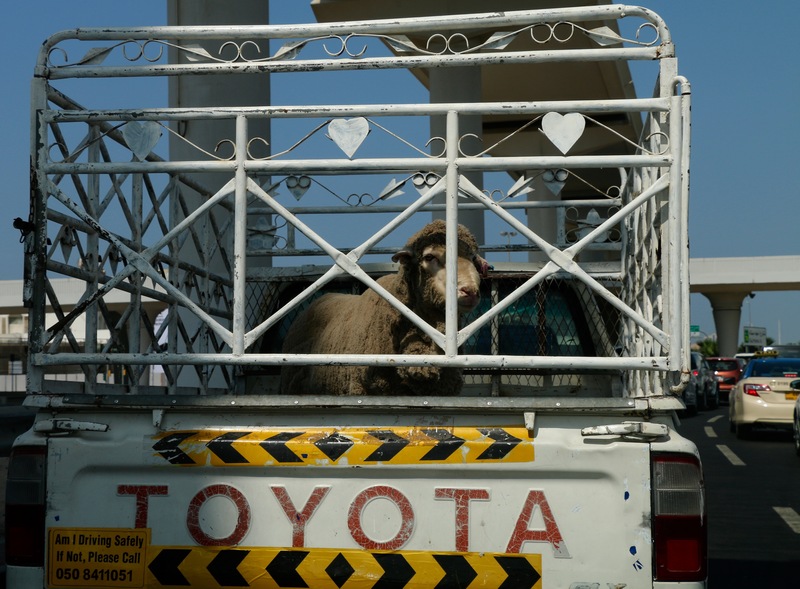 Seeing sheep in the back of Toyota trucks decorated with hearts and flowers in the middle of the main highway through the glamorous Dubai. 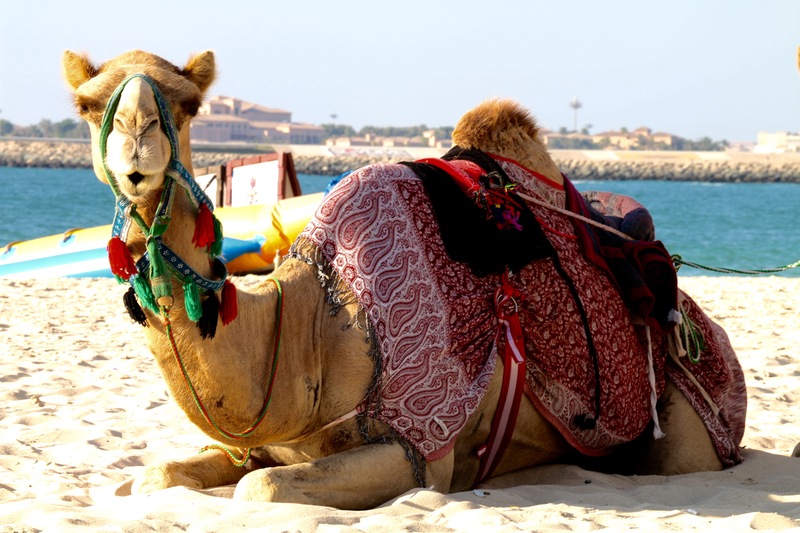 Seeing this camel at our local beach. We have got our visas and are now on the lookout for a place of our own. We leave behind good memories by this pool as we move to another pool. As always, life is hard in Dubai. Both of our work is going very well. My freelance thing seems to have taken off and there are some exciting projects for me to do, but I will tell you more about them next time. I am also working on my MA thesis, which looks at the the geopolitics of China in Africa and Chinese activities in Zimbabwe mining sector more specifically. Talking of which, we shall be in Zimbabwe and Mozambique from the 5th to 23rd January. So if any of you Zim people are there during that time, we are coming to see you! For now, it is time to have dinner of toasted Estonian bread and chocolate, provided by our many visitors. PS: It is getting really cold. Sometimes it gets under 30 degrees. Brr. Posted in Places, United Arab EmiratesTagged Abu Dhabi, Abu Dhabi cricket stadium, belly dancer, camel, cricket, Deira fish market, desert, desert safari, Dubai, Dubai border run, Dubai fish market, Hatta, Hatta dam, Hatta Heritage Village, Oman, Pakistan vs England, Sheikh Zayed Grand Mosque, test cricket, UAEBookmark the permalink. Very well written that made your adventures an interesting read Kati. I have been following your travels since you and David got together and always enjoy reading about what your both up to. Every now and then I catch up with David over a coffee and it is good to know that things are going well for you both. It is always good to know people are actually reading my blogs! It’s an excellent way to keep in touch with friends while living all over the world. Thanks, Steve! Love the idea of David as a poor Zimbabwean boy. Greetings to you too my favourite Canadian friends!